This post is a little later than I had hoped but June is one of those months, it gets very busy! This weekend I’ve been to Wireless Festival (which was amazing!) and Brussels but more on that soon. I don’t really love this as a dry shampoo, it’s okay but it doesn’t soak up as much grease (nice!) as the Batiste however it’s the best I’ve tried for adding texture but doesn’t leave the hair feeling too heavy. It has taken a while for me to find matte lipstick that are comfortable for me to wear daily so I haven’t put these down. The colours are wearable and the finish is beautiful but for a full review check out this post. I must be the only person on earth not to have tried this blusher until recently but I’ve really been enjoying it. I use it as a normal bronzer but also as a cheek or even eye contour as the matte shade works perfectly. Don’t take the word extreme lightly, although it’s not so much the plumping that is extreme but more the tingling sensation. I don’t believe lipgloss can really make a huge difference to the size of your lips although they may look slightly fuller. This shade is stunning for any sort of occasion and I personally love the feeling it gives my lips. I feel like I have spoken about this tan endlessly recently but it’s just that good. The colour is perfect and how quick it is has really been ideal! Juicy perfumes are always a good idea in summer and this is the one I have been reaching for, worth checking out if you need a new summer scent. 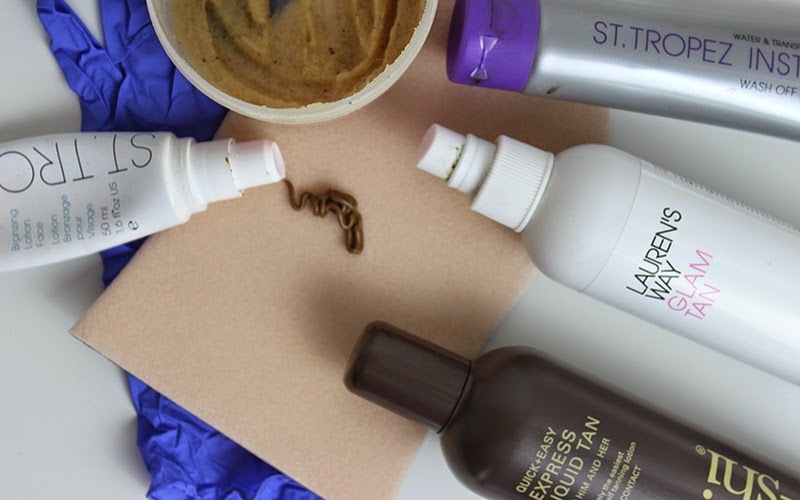 It’s no secret I love fake tan, I have a whole video to prove it (here) and after finding my two favourites (He-Shi Liquid tan and Lauren’s Way Glam Tan) I pretty much stopped looking for anything better. Recently I’ve been getting up at 5.30am and heading to the gym which has really effected how I fake tan. Usually I fake tan in the evening and wash it off in the morning but I simply haven’t got time for that before 6am and there is no way I could go to the gym with a guide colour! When I washed it off I was left with a beautiful dark but very natural tan with no streaks at all. I would say that it is a little drying but I just made sure I moisturised daily. The best thing about this tan is that usually I am asked which tan I have on, with this I get asked if I’ve been on holiday or if I’ve been to the beach. It’s as dark as I would like it but looks very natural and I love that you can wash it of any time after 1hour for your desired effect. I even had very knowledgable beauty bloggers ask if I had been away! The He-shi Rapid 1 Hour tan is a great new asset to my fake tan collection and I can’t wait to use it again, it may even become my favourite as it’s lasted a good 6 days with no patchy, uneven fading! What fake tan have you been using recently? Fake tan can often be quite scary as we are bombarded with fake tan mishaps in magazines and websites. However I absolutely love fake tan and really don’t think it need as be even half as scary as people think it is. With a little bit of practice, some tips and tricks, you will be able to get an even head to toe tan without any problems. Pre-fake tan- Before fake tanning make sure you exfoliate and shave. I like to do this the day before and my favourite body scrub is the Soap & Glory Breakfast Scrub, it’s quite abrasive but I think that’s what you need on your body to remove any old tan and dead skin. If you don’t feel like purchasing a body scrub I also think exfoliation gloves are great just teamed up with any shower gel you may be using. Also don’t forget to remove any deodorant/perfume you may be wearing. Fake Tanning- If you’re a newbie practice on your legs as you can easily cover this up if you do happy to go a little streaky. You also want to work in sections, for example your lower leg and then your thigh, it just makes it easier. Fake tan your hands last and make sure you don’t get any water on your tan. I’d highly recommend sleeping in your tan as this way you are far more likely to be streak-free as you won’t be dealing with water or anything else. Most products take 4-8 hours to develop before you can wash it out which is another reason why sleeping in it is a great idea. Post Fake Tan- After your fake tan is on for the given amount of time you will need to wash it off and should be left with an even colour. To prolong the tan you should avoid hot baths, moisturise regularly but also every few days to insure that the tan fades evenly. 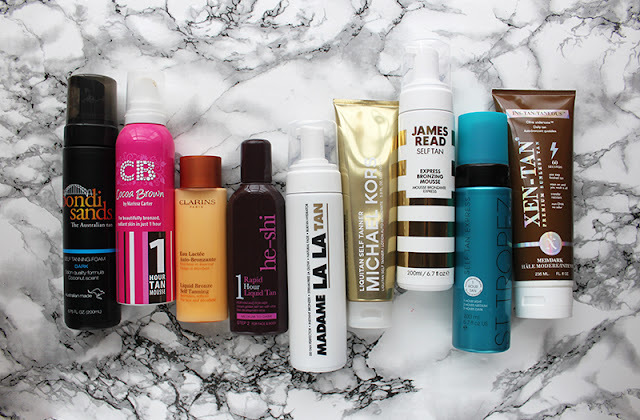 Check out the video to find out all about my favourite fake tans and more tips and tricks. It is a long one but hopefully it’s got all you need to know. I’ve been saving my used up product for the last few months and have a small collection going. 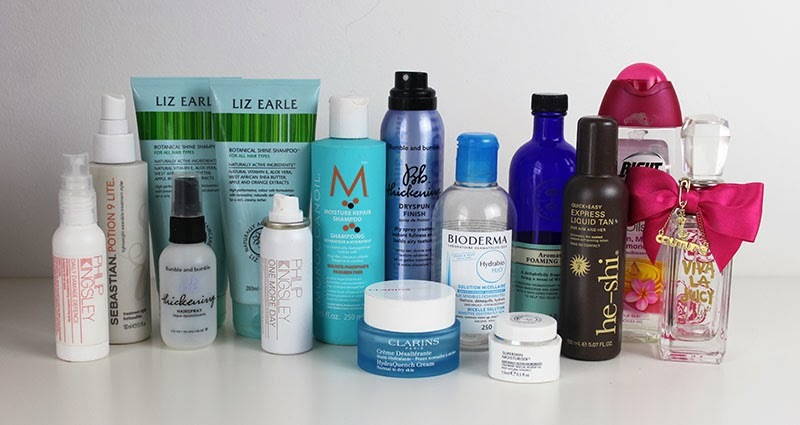 Although there isn’t really any makeup in here I have gone through various hair and skin products, some because I simply wanted to use them up to bin the packaging and other because I simply can’t be without them. 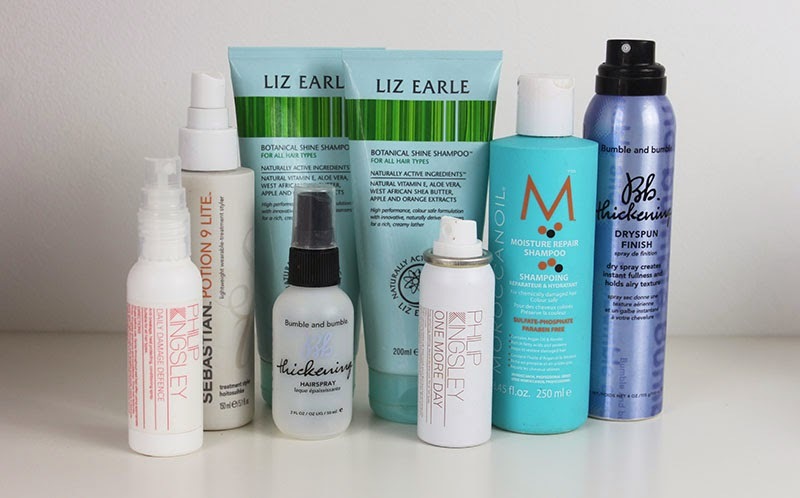 The one product I have clearly been using lots of is the Liz Earle Botanical shampoo as it has been my favourites for years and I don’t know how I live without it! I have already repurchased a bottle and am still using it. Another shampoo I have liked is the Moroccan Oil Moisture Repair shampoo, although it is a little too heavy for my hair it is nice when my hair needs some TLC. I have used up the Sebastian Potion 9 and the Philip Kingsley One more Day dry shampoo simply as I wanted to get through it and rid of the packaging. 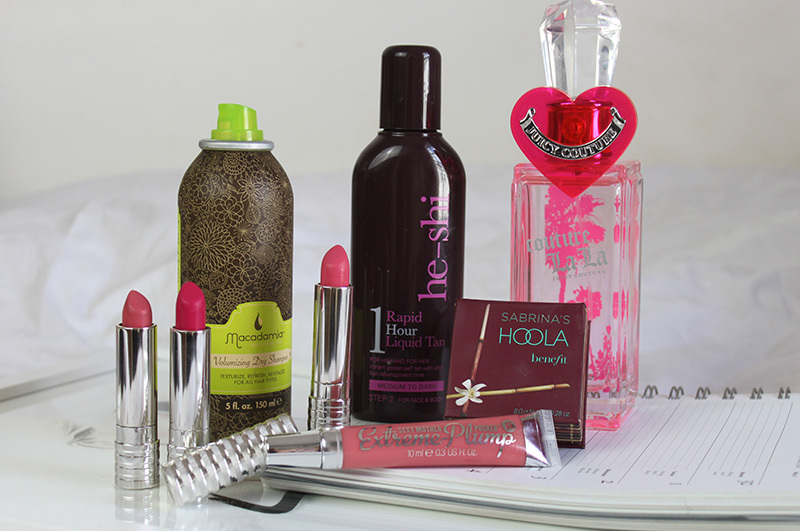 They are both simply mediocre products, I would use them again but would repurchase. I’ve also been showing Bumble and bumble some love having finished my beloved BB Thickening Dryspun finish and the Thickening hairspray. I have finally ended my love/hate relationship with my Bioderma water; as tempting as it is to use it really ruins my skin and I am happy that I can no longer use it. However I am sad to see my Juicy Couture La Fleur perfume go as it is my perfect summer scent (weird time to finish it!). 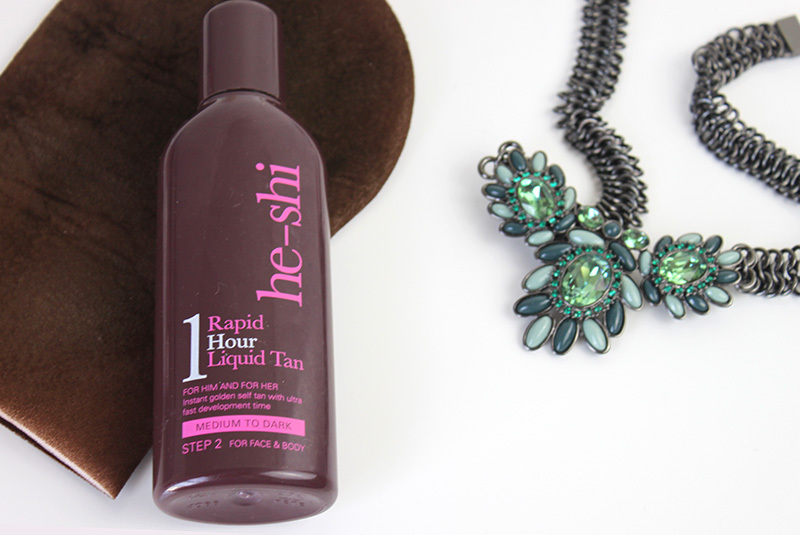 I have finished and restarted my he-shi Express Liquid Tan as it is one of my favourites. In terms of skincare I have reached the end of my Clarins HydraQuench cream which has been a favourite for a while but I don’t think I will be repurchasing quite yet. I have also used up the Liz Earle Superskin Moisturiser which I had in the perfect little travel size. The shower product I have finished is the very affordable but beautiful smelling Right Guard Shower and Oils as well as the Neal’s Yard Aromatic Foaming bath which is possibly the most perfect relaxing bubble bath! 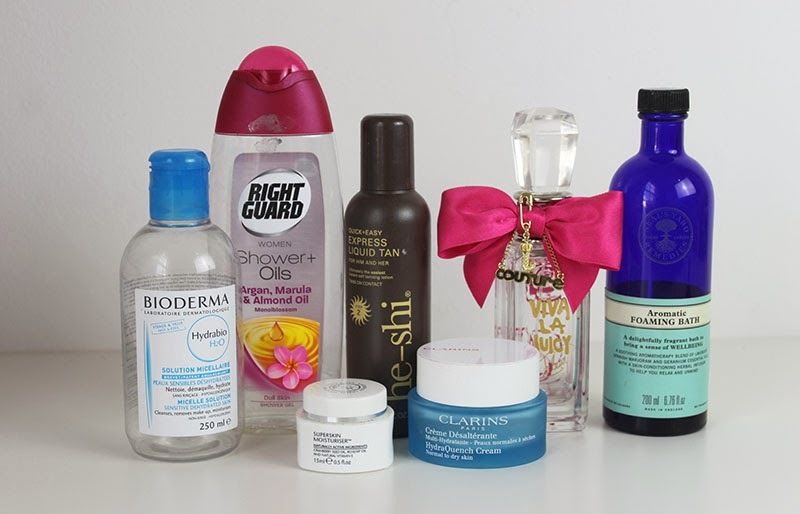 What products have you recently finished and repurchased?